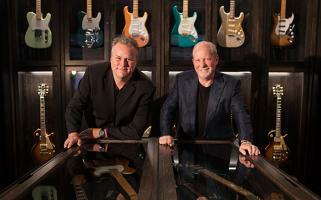 “We decided to build a Mecca for guitar lovers,” Songbirds Guitar Museum curator and COO David Davidson says. Located in Chattanooga, Tennessee, inside the historic Chattanooga Choo Choo Terminal Station, Songbirds is indeed destined to become a pilgrimage site for vintage guitar connoisseurs and music fans in general. With some 550 rare, fascinating, and beautiful electric and acoustic guitars on display as of the museum’s March 10 opening, Songbirds represents an interesting new concept in musical instrument museums. There is no permanent collection. Instead the instruments are on loan from many of the world’s foremost collectors, who prefer to remain anonymous. Audio-video material, artifacts, and other onsite resources help bring the stories of these exceptional instruments to life. Davidson and Smith began formulating the idea for the attraction several years ago. As co-owner of the New York vintage dealership We Buy Guitars, Davidson had cultivated deep connections within the guitar-collecting community, having procured coveted instruments for many collectors. He began to talk to his clients about lending some of their guitars to an institution where they could be viewed and appreciated by the general public. Creating the museum’s space within the historic train station was a $4.5 million project, masterminded by architect Thomas Palmer of the Chattanooga firm Cogent Studio. Layers of plaster and terra cotta tile were removed to reveal the structure’s original brickwork and steel beams. In an echo of the interior’s architectural features, display cases for the instruments and artifacts were custom-fabricated from steel and reclaimed hardwood by Range Products of Chattanooga. Of the museum’s total 7,500 square feet, about 6,700 are devoted to exhibit space. The instruments on display span the full range of vintage American electric and acoustic guitars and include a selection of banjos and mandolins. “It’s all vintage—no reissues,” Davidson says. 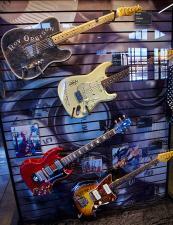 “We don’t have refinished guitars or guitars that have been modified or damaged and put back together. We take a lot of pride in that.” Davidson places the value of the instruments on exhibit at approximately $150 million, which isn’t surprising, considering that more than 30 sunburst Gibson Les Pauls from the legendary 1958–’60 period are on display. On the acoustic front, there’s a trove of pre-war Martins as well as a trio of 1924 instruments by iconic luthier Lloyd Loar: a Gibson F-5 mandolin, an H-5 mandola, and an L-5 archtop guitar, all with inside labels signed by Loar. The exhibit space is divided into three galleries. For a general admission fee of $15.95 ($12.95 for seniors and military; free for children under 12), visitors can view the main gallery. This is primarily an educational space that traces the evolution and cultural significance of the electric guitar in the Fifties through the Seventies through some 300 vintage instruments as well as audio, artifacts, and other resources. iPad stations and a custom iBook app provide more detailed information. Planned for the museum’s opening are breakout exhibits devoted to the British Invasion, surf music, and bluegrass. Guitar connoisseurs will want to pony up $36 for the museum’s all-access tour, which includes the main gallery as well as a guided tour of two additional galleries. One of these, known as the Green Room, is the site of an exhibit titled “The World of Color,” featuring a stunning array of custom-color vintage Telecasters and Stratocasters that represents, according to Davidson, “virtually every color Fender made.” This is accompanied by a comprehensive selection of custom-color Gibsons, including a large number of Firebird guitars and Thunderbird basses. The Green Room is also designed to host intimate concerts and other events. Also on exhibit in the Vault are a 1954 Stratocaster belonging to key Fender employee George Fullerton and a custom black 1954 Strat owned by guitar ace and early Fender endorsee Jimmy Bryant. Several prototypes from the hand of legendary German luthier Roger Rossmeisl’s post-Rickenbacker period at Fender are on display, including a hollowbody Stratocaster prototype and an early Thinline Telecaster prototype in Wildwood Green with two f-holes and block fretboard inlays. From Gibson’s history comes a 1954 Les Paul Custom with a chambered body, reflecting an early effort on Gibson’s part to make the Les Paul lighter. 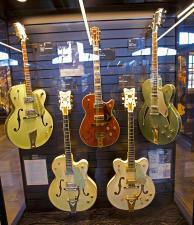 One unique feature of both the Green Room and the Vault is that visitors deemed qualified by the tour guide might be given an opportunity to handle and play some of the guitars on exhibit. This is one feature that makes Songbirds a little bit like a vintage guitar shop rather than a traditional museum. Along these same lines is Songbirds’ vintage guitar appraisal partnership with Davidson’s We Buy Guitars. While arrangements such as these might elicit cringes on the part of traditional museum professionals—not to mention owners of rival vintage guitar shops—they do promise an enhanced guest experience for guitar geeks who visit Songbirds. Smith admits that the museum’s unique concept did make it a difficult sell at first for potential investors and others. But that began to change when legendary country guitarist and noted collector Vince Gill signed on as the museum’s ambassador. He performed at a pre-opening party at Songbirds on March 9, and museum guests will be greeted by a welcome video that Gill taped for the museum, played on a giant 16-by-eight-foot LED screen at the museum’s entry. Gill also curated a display case exhibiting 15 iconic guitars from the museum’s collection that parallel instruments from Gill’s own personal collection. These include a 1938 Gibson Advanced Jumbo, a 1939 Martin 000-45, a 1950 Broadcaster, a 1954 Stratocaster, a 1956 Gretsch Sparkle Jet, and a 1959 Gibson Les Paul. 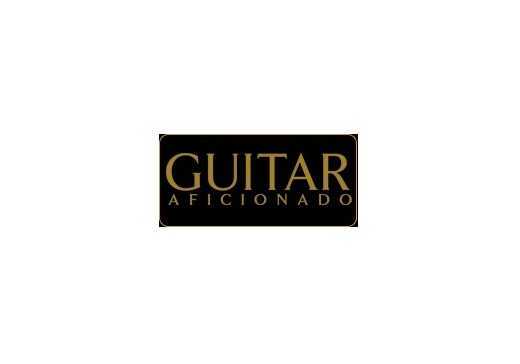 To learn more about Songbirds Guitar Museum, visit their website.